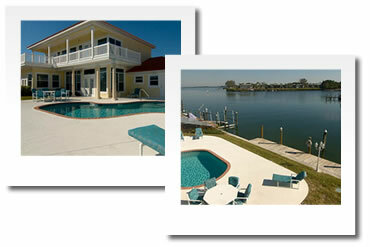 Holiday homes and condo rentals for rent Sarasota and Anna Maria Island, Florida. Over Sunshine SkyWay Bridge we can offer houses and condominiums in the pristine Sarasota area. Sarasota is a vibrant city with beautiful beaches and a lively downtown area, which offers a wide variety of performing arts organizations, including opera, ballet, symphony and theatre. All are easily reached from our accommodation alternatives. Drive over the bridge from Sarasota city centre, turn to the left at St. Armands Circle and you will find Lido Key. St. Armands Circle is a sophisticated mix of shops, galleries and restaurants. Turn right at St. Armands Circle and you will reach Longboat Key, a tasteful luxurious manicured community. This 12-mile long island offers many upscale condominiums and private homes situated directly on the Gulf of Mexico or overlooking Sarasota Bay. Over the bridge on the northern end of Longboat Key you will find Anna Maria Island. This seven miles long laid-back community can boast some of the most beautiful natural beaches in Florida. High rises are strictly prohibited on Anna Maria. Holmes Beach, Anna Maria Beach, Coquina Beach, Cortez Beach and Manatee Beach, here you can visit and enjoy them all. With three piers, fishing is the favourite pastime and casual seafood eateries dot the coastline. 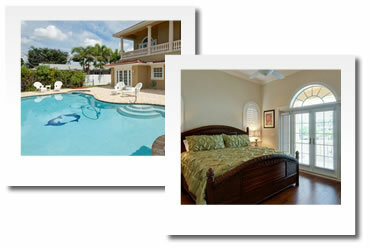 - All properties have a private pool and will either have an easy walk or a 5 min. drive to the beach. - Fully furnished, including linens, towels, dishes, cookware, etc. - Photos and info of home will be given at time of booking. - Minimum Stay: All rates are 7 nights minimum.